Before considering how to make the most effective use of whatever passes or tickets you have, it would be helpful to read the preceding section on the trains (pp35-59), if you have not already done so. If your journeys have to be fitted into a limited period much of your time may be spent on quality trains, which will become your travelling hotel. You will need to take enough clean clothes and money to last, because there will be limited time for shopping or bank transactions after leaving your starting point. With a Flexipass you can have more time to look around at places you reach, you will be able to do your banking and have your laundry attended to. You can plan your own excursions from selected bases, leaving your heavy luggage at a hotel to be called for later. You need not always rent a hotel room for this: it is usually possible to come to some arrangement with the management. Luggage can also be left at railway station depositories (though these can be expensive) and laundry can be left at laundries where it belongs. Remember to keep a note of where you've left everything: it is annoying to have to make a special trip back somewhere just to collect a suitcase or a couple of shirts you had forgotten about. Whatever you do, watch the days of the week! Saturday afternoons and Sundays must be counted as dead periods for attending to these necessities. Even in Sydney on a Sunday it is almost impossible to obtain cash unless you have a card with a pin number and can find the right autobank (cash machine). American Express and Thomas Cook offices are useful in an emergency but you will find them only in the larger cities. It is easy to forget the day of the week when travelling on long-distance trains such as the Indian Pacific. Time-zone changes are enough to contend with as it is. The additional comfort of a sleeping berth (not covered by rail passes) is not prohibitively expensive. A twin-berth sleeper on an interstate train costs up to 30% less than the price of a double room in a first-class (four-star) hotel in a city such as Melbourne. For the single traveller the difference is even greater. Although the train cannot offer quite the luxury or spaciousness of the hotel it is still, with air-conditioning, privacy, handy toilet and shower, an attractive proposition for the traveller wishing to use limited time to the best advantage. By spending some of your nights sleeping comfortably on a train you can wake up in a new place every day with new things to see and do. You will not only save money and cover more of the country, but have opportunities to meet, talk and relax with people far more than in a lonely suite in a big city hotel. Depending on where you want to start and finish your tour, you can visit all the mainland state capitals of Australia; Perth, Adelaide, Melbourne, Sydney and Brisbane in less than a month and you can include a side trip to Cairns, Alice Springs or even Darwin as well. Getting to Alice Springs by train is simple, thanks to the twice-weekly Ghan service from Adelaide, with connections from Melbourne and Sydney (C 9034, 9035). However, travelling to Alice or Darwin by train from the west involves either changing at Port Augusta at inconvenient times and with no sensible connections or diverting to Adelaide and back en route. Table 1 opposite shows how inconvenient such a journey can be. Yes! Despite some time-consuming non-connections (see Table 1 opposite), you can actually travel round most of the country by train in only two weeks. But if you want to make the most of any Australian railpass in a limited time it is imperative that you make advance reservations for all the trains on which you will need them. Your first decision must therefore be the cities at which your rail tour will begin and end. In planning your itinerary it is important to realize that Australia is nearly as big as the United States of America and three-quarters the size of Europe. Texas would fit into a corner of Queensland – and does! It is in fact the name of a little town on a former freight branch (the trains used to carry a passenger van) in Queensland's south-west. In the old days a trans-Australian journey by rail was not for the faint-hearted. Breaks of gauge, changes of train, intense heat, dust and flies made it something to be contemplated with misgiving and remembered with mingled horror and amazement. Many are the tales that have been told and the books that have been written. As recently as 1970 it was still not possible to go from Sydney to Perth without four changes of train – at Melbourne, Adelaide, Port Pirie and Kalgoorlie. It still takes three days to cross the whole continent. The return trip takes six days if you start from Perth, seven if you start from Sydney, and this without spending much more time at the other end than it takes for the train to be turned around, cleaned and reprovisioned (5 hours in Sydney, just over 24 in Perth). It is therefore sensible, if you want to avoid going backwards and forwards over the same route and cover as much of the country as possible in a limited time, to plan your arrival at one port and your departure from another. This can often be arranged easily when making your airline bookings. Many international flights regularly serve Perth, Sydney, Melbourne and Brisbane. Cairns and Darwin are also on several regular international routes. Sydney is the base with the greatest concentration of rail as well as external air routes, but starting your rail trip in Perth and finishing in the east or starting in Queensland or Darwin and finishing in the west can give better options for the holder of a short-term Austrail Flexipass. Also, many airline package deals to and from Australia allow one or more internal flights without extra charge. This sort of concession could be useful for bridging some of the gaps in the rail network such as Perth-Darwin-Cairns or for travelling direct between Canberra and Melbourne without having either to change trains at Goulburn or use the bus between Canberra and Cootamundra. The Austrail Flexipass, which has now entirely replaced the former consecutive-day pass is a real boon to travellers who wish to spin out a tour by spending several days, perhaps a week or more, in one place before going on to another. Journeys can be spun out over a six-month period, or if wished concentrated into a selected number of days one after the other or nearly so. But see the warning on p64. With almost any itinerary at all, some retracing of route is necessary because there is no real rail network in the sense of a web of intersecting routes as in Europe. Basically, Australia has a fundamental triangle of passenger main lines – Adelaide, Sydney, Melbourne. Every other route, however long or short, is a dead-end system branching from this triangle, with here and there a minor loop on one of the branches. To give some idea of the time-scale of things, the basic south-eastern capital-city triangle takes a minimum of 2 days 21/2 hours (clockwise from Sydney starting on a Thursday) to 3 days 65 minutes (anti-clockwise from Melbourne starting on a Tuesday). This is shown in Table 2 opposite; the summary table of interstate trains on the basic south-eastern triangle. Alice Springs is a three-day round trip from Adelaide and Darwin (more from Sydney or Melbourne) whilst Cairns is a five-day round trip from Sydney. You can just go from Perth to Cairns and back, or vice versa in 13 days, but you would not have much more than a night there or anywhere in between. On many interstate trips you will cross time zones, which may vary with the season. Summer time operates in the eastern states except Queensland. As a general rule, travelling west between the eastern states and South Australia, you put watches back 30 minutes and between South and Western Australia back 90 minutes; forward in the other direction. Be careful at Broken Hill, which is in New South Wales but observes South Australian time. The train conductor will clear up any doubts for you and in fact west of Adelaide the train operates on its own sweet time, so you need not worry unless you need to telephone somebody. This book offers some ideas on how to make good use of the Austrail Flexipass if you are staying for a month or more, but if you are limited to an ultra-short stay the most you can pack into it in the way of rail travel is set out in the following five itineraries. These packages are essentially quick reconnaissance tours – seeing on the move. Using only the 15-day Flexipass any of them can be achieved in less than a month. Most visitors would probably prefer to spread these itineraries over a longer period. This can now readily be done since the Flexipass covering 15 or 22 days of travel can be spread over six months, but if you are really pushed you can see an astonishing amount of the country in a very short time – and at little cost. It is possible even in 15 consecutive days to visit all the mainland state capital cities as well as the national capital of Canberra as Itinerary 2 (p68) shows. But be warned. Fifteen-day ‘maximum mileage’ itineraries are not for geriatrics or the faint-hearted, though if you ‘boldly go’ you will have something to talk about for years afterwards – and few people will believe you did it all by train! These itineraries cover mainly capital cities, but capital cities are not what everyone wants to see. To many visitors, an Australian trip would not be fulfilled without seeing romantic places like the ‘Town called Alice’ or the railway station at Kuranda. Itineraries can easily fit in trips either to the ‘red center’ or to tropical north Queensland, or both. Caution! If you insist on staying for a night in the middle of the Nullarbor, climbing to the top of Ayers Rock or scuba-diving off the Barrier Reef, you are not going to manage it in 15 days – even though a day away from trains does not count as a day off your Pass. But you can come close to such achievements if you plan your itinerary carefully, following the advice given in this book. Note that the Flexipass and other rail passes do not cover air or boat trips, nor are discounts offered on other transport as, for example, with the Eurailpass. Whilst the first two 15-day itineraries are based on Sydney, more economic and interesting use can be made of an Austrail Flexipass if you start your journey on one side of Australia and finish it on the other. After all, you may feel that one crossing of the Nullarbor in 15 days of travel is sufficient (though many travellers find it draws them back again and again – the writer is one). Further sample itineraries therefore allow such variation. Whilst the itineraries featured in the book are almost exclusively limited to rail travel, making the journey between Perth and Darwin by air would enable the holder of an Austrail Flexipass or Great Southern Railway Pass to avoid retracing some routes. This would allow more time for side trips and variations in an itinerary. For example, in Itinerary 3 (p69) Flexiday 3 is spent returning to Adelaide from Alice Springs, followed by a two-night stopover before travelling on to Perth in flexidays 4 and 5. The next two flexidays are spent returning from Perth across the Nullarbor to Adelaide. By that time you will have traversed the line between Adelaide and Tarcoola (the junction between Trans-Australian and Darwin routes) no less than four times. It was explained (see p68) that although the time in Alice Springs would allow continuation to and from Darwin this would add two flexidays of travel. If instead of returning south from Darwin you flew from there to Perth, only one flexiday, number 3, would be used up before the start of the eastbound trip across the Nullarbor. This would provide two spare flexidays for some side trip or other variation later on, and the airfare might be no more than the surcharge you might otherwise consider justified if deciding to upgrade to sleeper or Gold Kangaroo on the two-night stint across the Nullarbor. Itinerary 1 shows how it is possible to spend a day or more in each of the mainland state capital cities, as well as time in north Queensland in less than a month, using a 15-day Austrail Flexipass. Travelling to the NSW coast, north Queensland, South Australia, Western Australia and Victoria, this itinerary based on Sydney allows stopovers in Brisbane, Cairns, Perth, Adelaide and Melbourne with seven nights on trains and a return to Sydney half-way through. Sleeping berths are available (at extra cost) on overnight trains. This itinerary allows one day in hand (Flexiday 15), which might be used for a day trip from Sydney eg to the Blue Mountains or down the Illawarra coast. 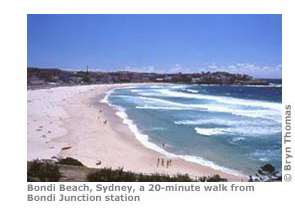 See the section ‘Longer day trips from Sydney’ (p128). Even this simple itinerary is capable of variation and extension. For example, since the Cairns-Brisbane direct journey uses two flexidays (the quickest by Tilt Train taking just less than 25 hours), there are some attractive options of breaking the journey without using any more flexidays. A break can be made at Townsville or further south as far as Mackay at reasonable hours of the day. The table on p67 shows these options. If the pass is used consecutively with stopovers lasting one night only, a minimum of 16 calendar days is needed, but it should be noted that not all the trains run every day of the week so that if you decided to spend an extra day or two in some place, you might not find a train on the day you are ready to leave. For example, if you miss the Indian Pacific from Sydney on a Saturday, the next one would not be until the following Wednesday. Although the tour can be started on any day as the Sydney–Taree–Brisbane trains run daily, different days of starting mean different numbers of consecutive calendar days used to complete the tour. As another example, if the tour starts on a Friday, with the trains to Taree and Brisbane, 19 consecutive days would be the minimum, since a stopover from Tuesday to Friday would be required in Adelaide. On the other hand, if a Brisbane stopover were taken at the end of the first flexiday this would not add to the number of flexidays used, but would add to the total calendar days. Stopovers can be any number of days within the six-month validity of your Pass. This itinerary can equally be based on other capital cities (Melbourne, Brisbane, Perth or Adelaide), or on Cairns. For example, if based in Melbourne, Flexiday 1 would be as Day 14 below, Flexiday 2 would allow a Sydney-based day trip, Flexiday 3 would be as Day 1 in the example, Flexiday 4 as Day 2 and so on, with Flexiday 15 as Day 13. To show more clearly how a round tour can be made in only 15 days, this itinerary is set out in consecutive day order. Most trains run on other days, but travellers are warned that introducing one or more overnight stops in any of the places not shown with such a stop in the specimen itinerary would exceed the 15-days of the Flexipass. Based on Sydney, it allows a visit to each mainland State capital, Perth, Adelaide, Melbourne and Brisbane, with a full day or more in each, a full day in Canberra and seven nights on trains. It uses only 12 flexidays, leaving three days which can be used for other trips afterwards or by varying the itinerary, in either case extending the travel period beyond 15 calendar days. Possible variations might be to take an out-and-back two-day trip from Brisbane to Charleville in south-west Queensland or to further north like Bundaberg or Rockhampton before returning to Sydney, or to break the final return journey at Maitland and make a two-day trip up the Hunter Valley to Tamworth or Armidale. This itinerary shows how a 15-day Flexipass can economically be extended over a full month, with useful two- or three-night stopovers in different places. Based on Sydney, with a return to base half-way through, it allows visits to Alice Springs, with ample time to visit Uluru (Ayers Rock) or even enjoy a night-stop there, Adelaide, Perth, Melbourne, Cairns, plus the Kuranda Scenic Railway, and Brisbane. Ten nights are on trains with sleeping berths available at extra cost. Note that on Travel day 19, the Sydney-Brisbane-Cairns journey covering Flexidays 10 and 11, must be booked through from Sydney. Important: Although the time in Alice Springs would allow continuation to and from Darwin with a nightstop there, this would add two flexidays travel, which would mean either finishing the trip in Cairns or obtaining a 22-day instead of a 15-day Flexipass. Note that in this itinerary travel day numbers are in two columns, showing Travel day ie consecutive days in a month of travel, and Flexiday ie the 15 Flexipass days. Starting in Darwin and ending in Perth, this itinerary includes visits to all mainland state capital cities plus Canberra, Alice Springs and Cairns (including the Kuranda Scenic Railway). It offers the opportunity to travel on Australia's three top trains ie The Ghan, Queenslander Class on the Sunlander, and the Indian Pacific. There are eight nights on trains, with night-stops where indicated. A minimum of 18 calendar days are needed if used consecutively with stopovers for one night only. Starting in Perth on a Wednesday or Sunday and ending in Cairns, north Queensland with eight nights on trains and visiting all the other mainland capital cities including Canberra and Darwin, plus the Blue Mountains, Hunter Valley and holiday coast of New South Wales. Night-stops include Alice Springs and Maitland in the Hunter Valley. Taking a minimum of 18 calendar days starting Wednesday, with stopovers one night only except where more than one are needed between trains, eg at Adelaide (Friday and Saturday nights) or Alice Springs (Saturday and Sunday nights if arriving there on a Friday): 21 calendar days would be the minimum required for a Sunday start in Perth.